The budget deal passed in Springfield this week included an increase in the state’s personal income tax, and as the tax rate went up, so did Illinois’ ranking among all 50 states. When lawmakers voted to override Gov. Bruce Rauner’s vetoes, ending the more than two-year impasse, they implemented a permanent tax increase – bringing the personal income tax rate from 3.75 to 4.95 percent, and the corporate rate from 5.35 to 7 percent. 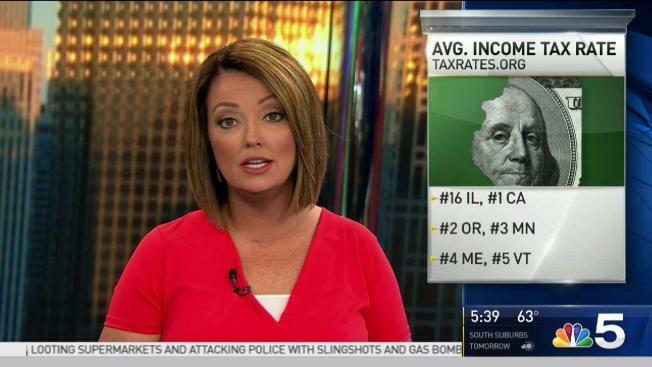 With this week’s tax increase, Illinoisans now pay the 16th highest average income tax rate in the nation – 17th if you include the District of Columbia. Based on a provision in the state Constitution, Illinois collects income tax at the same rate for all residents regardless of income, rather than a progressive structure (which taxes higher earners at a higher rate) used in 35 other states and D.C. Among states that use a flat tax, Illinois ranks 4th, after North Carolina (5.75 percent), Massachusetts (5.2 percent) and Utah (5 percent). Three other states employ a flat tax: Michigan (4.25 percent), Indiana (3.3 percent) and Pennsylvania (3.07 percent), while seven states – Alaska, Florida, Nevada, South Dakota, Texas, Washington and Wyoming – collect no income tax at all. Tennessee and New Hampshire collect 6 and 5 percent, respectively, but only on investment income, not salaries and wages. Of its Midwestern neighbors, Illinois’ tax rate is now third highest, ranking under Minnesota’s average rate of 7.53 percent and Wisconsin’s 5.94 percent. Both states have a progressive tax, with Minnesota collecting between 5.35 and 9.85 percent, while Wisconsin varies from 4 to 7.65 percent based on the taxpayer’s income. Six of the top 20 states with the highest average rates collect a flat tax, though just two of those are in the top ten. Illinois’ tax hikes were part of a revenue package to address the impact of the budget stalemate, which has left the state with a $6.2 billion annual deficit and a $14.7 billion backlog of overdue bills. The personal income tax increase, combined with the new corporate tax rate, are projected to raise roughly $5 billion in revenue.